Do you struggle with sun damage, pigmentation, age spots or uneven skin tone problems? Dermatologists have been eliminating fine lines, wrinkles, sun damage and other undesirable skin conditions with help of resurfacing lasers for years. CO2 for reducing wrinkles or severe sun damage. Fractional Thulium is a non-ablative laser treatment that is for used for complexion blending. It strengthens skin and gives it a freshness that very few other treatments can do. 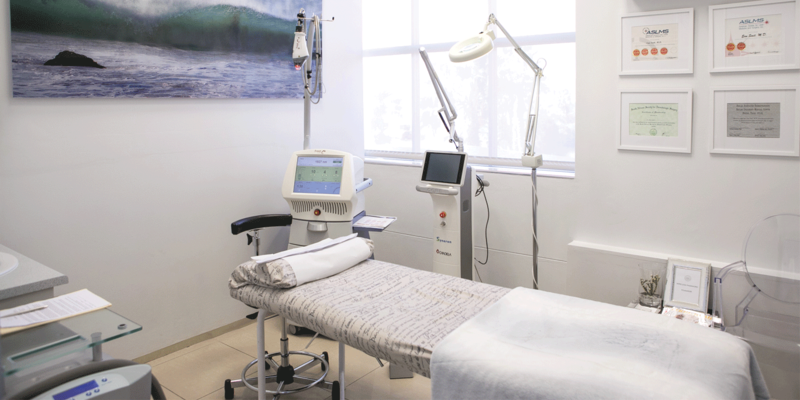 Thulium is also the medical laser of choice in the treatment of actinic keratosis – a crusty, scaly growth caused by damage from exposure to ultraviolet (UV) radiation and the early signs of skin cancer. The Fractional Thulium Laser treats sun damage, known as “actinic damage”. Take note that the laser does create some downtime, which needs to be taken into consideration. One of the unique key indications of Fraxel is that it offers a solution for treatment areas that have been untreatable in the past, such as the neck, chest, arms and hands. Safety is a key feature of Fraxel technology that has not been overlooked. In most patients, it can achieve 20-40% of the results of standard laser resurfacing (with minimal downtime and side effects). The technology is highly advanced and many safeguards have been built into the system, enabling us to treat a wider range of skin types. This treatment fits into its own niche between the less aggressive microdermabrasion and Photofacial on one hand, and standard ablative laser resurfacing on the other. The treatment area acts as a computer screen with many pixels that are unable to be seen with the naked eye. Only a “fraction” of the pixels (17-20%) are affected with each treatment. With 80-85% of the face untreated, the healing is rapid, safety is guaranteed and the downtime minimised. The best candidates are those with mild to moderate wrinkles, who have brown age spots and rough skin – all characteristic findings of actinic damage. For patients with an outdoor lifestyle or living in an “outdoor” environment, such as sunny Cape Town, that is subject to the ongoing free radical damage and, despite their best efforts, have suffered sun damage and mild to moderate wrinkling, this treatment would be ideal. This treatment is not for those who have primarily vascular issues, such as redness, Rosacea, telangiectasia or broken capillaries. Photofacials or Pulsed-Dye Laser would serve these patients better. This treatment is not also not ideal for those requiring significant improvement in skin laxity or the treatment of severe wrinkles. Treatments are classically repeated every 4 weeks so that eventually the entire face, neck, chest and hands can be treated thoroughly. Therein lays the basis for the development of fractional resurfacing. Take note that the more aggressive the treatment and the higher the fraction treated with each treatment, the more downtime the patient can experience. The treatment pixels vary in thickness and depth, depending on the energy utilised and the number of passes. The heating of these tiny columns of tissue destroys the old and damaged collagen fibres. The skin releases the destroyed collagen to the skin surface, resulting in the skin feeling dry and flaky, much like sandpaper, for a few days. The columns of heated tissue initiate a response by the body to lay down a new layer of youthful collagen as part of wound healing, thus addressing and improving mild to moderate wrinkles. This collagen remodelling is done over time; therefore the final result may take several months to maximise. These columns of tissue are fairly unique in the fact that they can be much deeper than any standard laser treatment, such as Photofacials or Vascular Lasers, and the treatment is even deeper than standard laser resurfacing itself. The key is in sparing 80% of the skin surface with each treatment, which allows continuation of normal daily activities within 24 hours with the exception of aggressive treatments on sensitive skins. Patients see significant improvement in alteration of the colour of the skin (dyschromia) and hyperpigmentation and mild to moderate improvement of wrinkles. The value of this treatment is that every patient sees an improvement, unlike some other techniques, which may be more variable. Depending on the aggressiveness of the treatment a 20-40% improvement of wrinkles and a 70-95% improvement in pigmentation can be expected as the result of 3 to 5 treatments. The more aggressive the treatments and the higher energy the patient can tolerate, theoretically, the better the result. Most patients have several hours of mild swelling and redness, much as if they have acute sunburn. The redness usually fades within a day, although in sensitive skins it can last for 2 days. Mild and residual swelling, noticed most commonly around the eyes for 24 hours, may also be lengthened to two days in sensitive skins. All patients have been able to return to work the following day, depending on the patient’s schedule, personal desires and aggressiveness of treatment and sensitivity of the skin. Scaling or scabbing and crusting are extremely rare and have been unreported to date with Fraxel. In order to promote the production of new collagen, the laser treatment needs to reach the dermis and will have some effect on the nerve endings, which results in variable degrees of discomfort. Superficial and mild treatments are not painful, but lack the effectiveness that most patients with the conditions noted above require. Fractional resurfacing is a reasonable compromise, as the discomfort is manageable. Patients describe the sensation equal or mildly more uncomfortable than a Photofacial (IPL), but not nearly as uncomfortable as Thermage. The face needs to be prepped with a topical anaesthetic gel, which is applied 45-60 minutes prior to the treatment. This suffices for most patients. Every patient’s pain tolerance is different, but extreme measures, such as oral anti-anxiety medication or narcotics, should not be necessary.